Content Curation is a valuable instrument in content marketing and social media. But for many people, it is not clear what content curation is. In this very short definition, the most important part for me is that content curation needs to provide value. That is what makes the definition of content curation so hard to grab. There is a thin line between simple content aggregation and content curation. In social media, the simple difference may be that you check what you are sharing and maybe add a little comment of your own in contrast to blindly (or automated) sharing content provided by others without actually knowing what you share. In content creation, this thin line lies between aggregating a simple list of content sources and curating existing content and adding comments, additional information or even take a different point of view. People often cross this line in an attempt to get more out of their social media without putting in the necessary time and effort. Some tools can help you automatically retweet content that includes certain keywords. That is content aggregation. Spending time on browsing your favorite blogs and share only what you read and liked that is social media content curation. Content curation should always add more value and something from yourself. Your audience will recognize the effort. Trying to game social media and content marketing processes without considering the ground rules often backfires. To know how to use content curation in your social media and content marketing efforts, you need to understand what content curation can do for you and what it cannot do. Many times I get asked: When I start with social media marketing, what should I post? I don’t have enough to say, and I cannot produce enough content. And that is precisely where content curation can come to your rescue: No matter how much own information, content, and value you have to share, curated content can help you find even more valuable information to share in your social channels and thus add value. If done right, you can use content curation to get your social account in front of a broader audience by adding the social account of the author or source of your curated content. One of the biggest challenges for businesses in social media and content marketing is to come up with enough content. 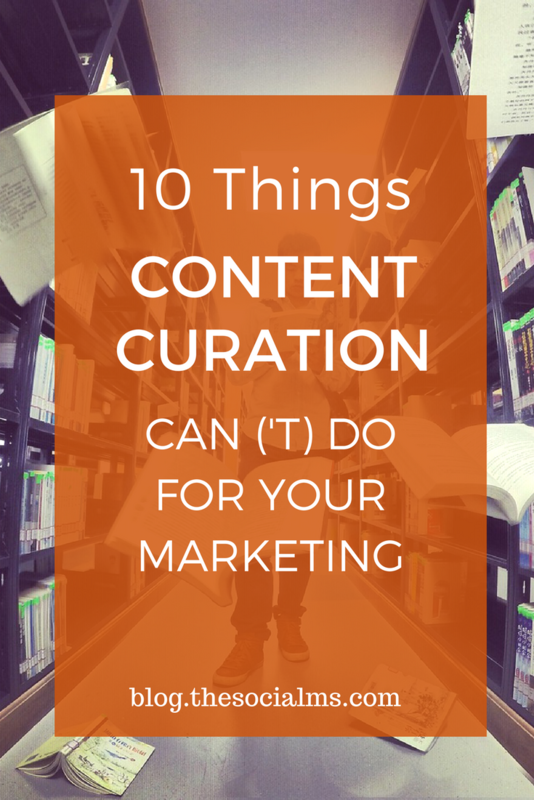 Content curation can help you fill that need. When you share curated content on your social channels, it will not only help you fill the gaps when you do not have enough of your content to share. Curated content can add value to your accounts by adding a new viewpoint and more expertise to your channels. By curating content and sharing this content, you can show how well informed you are. That you know the sources of valuable information. Your audience can see that you look beyond your existing knowledge and know where to find the best information. They will also recognize your effort to share this knowledge and information with them. Content curation cannot only help to fill your social channels, but it can also help you to come up with new content ideas. Of course, I am not talking about copying other peoples’ content. But you can respond to a post, you can make a collection of resources on a given topic, you can contradict a piece – or write your personal take on a subject. Did you know that you can use content curation to connect to people? Let the author of a piece you share know that you curated his/her content. You can mention them in your social media updates. You can comment on their original piece of content. Or you can let them know via email how you responded to their piece of content. This can even inspire a public conversation about the topic, which will even add more value. Your audience will appreciate it. Content creation is a time-consuming task. Even finding topics for your content can be a hassle. Content curation can serve as an efficient way to find new content ideas and even help you with your content creation. There is so much great content and knowledge out there that it would be a shame not to use it. Heidi Cohen gives some great advice on how to curate content into new valuable pieces of content by adding your voice to the information. By now you should be able to see the value of content curation for social media and content marketing success. But however valuable content curation is to you, there are some things content curation cannot help you with, even though many people still think it can. Ok, this needs some clarifying. Curated content on your social media channels will not directly give you traffic. If you only share other people’s content, you will not gain traffic to your site. But if you use curated content to grow your social media audience, this audience may give you more traffic to your website once you share your content. However, if you run our social media channels on curated content only you may well build a social audience, but you will not increase traffic to your site. If you only share other people’s great content, you are not an expert in your own right. You are a content distributor and source of information, but you are not the expert. To position yourself as an expert in your niche, you need to add your own voice and share your own knowledge. As said before content curation is not the solution to all your social media problems. It can help you grow a social account by filling the constant need for more content. But even this content curation cannot be done on autopilot. You will always have better results with social media if you put in the effort, add your personality and voice. Some tools can automatically retweet and share content which fulfills given conditions, but this sort of automation always comes with the risk of hurting your reputation. You can never be sure if what you share per automation comes up to your standard or if you share crab. Content curation does not come with a magic button. You can use it to give impulses and ideas and fill gaps in your content marketing and social media marketing process. For real social media and content marketing success, you will still need to use your brain: Think about how to best use this curated content, how to connect with it and how to get the most out of it. A good content curator is easily also a good content marketer. A bad content curator can utterly fail in social media and content marketing.